Your tour commences from Hong Kong International airport where you will be transferred into China by private charter for your golf vacation at Mission Hills – the largest golfing resort in the world. The facilities at Mission Hills, Dongguan are world class and can be “mind blowing” for the club golfer. No expense is spared bringing golfers an abundance of choice and quality that is beyond compare. Home of the 41st World Cup of Golf in 1995 this was the first course in China to be accredited by the US PGA for major professional competitions. 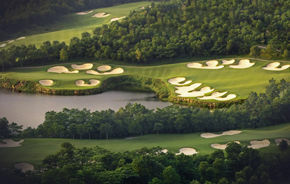 Winner of multiple international awards and heralded by the authoritative US golf publication LINKS as “one of the ten most significant and influential courses of the last 20 years”, Mission Hills’ World Cup course is widely hailed as one of Asia’s best golfing experiences and should be on every golfers ‘bucket list’. Opened in early 1999 to great critical acclaim from the international media, the Faldo Course is destined to become Asia’s premier tournament venue. Faldo’s abundant use of water hazards ensures a strategic approach is necessary for a good score. With many elevation changes and a dramatic course layout, you are sure to stand on each tee inspired to play your best golf! The world-renowned instructor devised a layout meant to challenge and teach players without intimidating. Generous fairways, short par 4s and elevated tees are prevalent throughout. 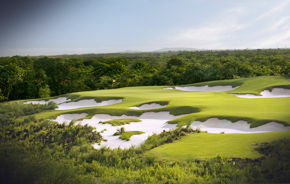 Yet it also features large, sand-flashed bunkers and fairways that while wide, rarely yield a perfectly level lie. It requires the player to use every club in the bag at some point in the round, just as any top-notch instructor would demand. A visually stunning course design that will challenge your senses as well as your golf! This course diverts through untouched jungle and natural flowing streams which create outstanding backdrops throughout the golf course. The signature square tees, along with undulating concave paspalum fairways, are two distinguishing features of this true championship course. With perfectly manicured fairways and in excess of 150 bunkers this is a winding layout that will leave you wanting more. Greg Norman has blended a course of links style dunes and grasses that meanders though mountain ridges and hillsides on the outward 9, then return via a series of valleys with lush forest vegetation. 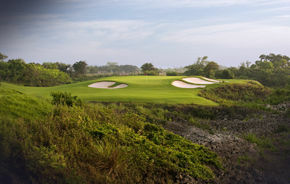 Combined with narrow fairways this has resulted in the layout’s reputation as one of the most difficult courses in Asia. An exceptional course to conclude an exceptional week of golf in an amazing Country! Price is based on a group of 4 golfers and subject to currency fluctuation. The Mission Hills complex on Hainan Island has 10 superb courses to choose from, so we have set out a typical itinerary and costing below FYI. Courses can be added or deleted depending on your appetite for challenging or relaxing, fun golf courses. Rest days are a great idea too as it is a beautiful island to explore. Your tour commences when you arrive at Haikou International airport where you will transferred to the fabulous Mission Hills Hainan resort. 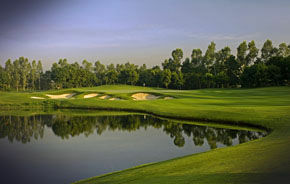 An easy introduction into Mission Hills, Hainan, this course has generous fairways and true, beautifully rolled greens. The natural terrain is frequently contrasted by striking, abrupt mounds, deep pots, square edges, ridges, blind shots, long and thin bunkers near both small and huge greens with wicker basket pins. A “drivers paradise” driver you can attack this course but make sure your putter is on fire as some greens measure as much as 50 metres long! The second championship course, Lava Fields is dominated by the black rock and sand from the volcanic surrounds. A relatively open course, with wide fairways that allow you to set up your strategy for attacking the pins you must have your yardages dialled in as the green surrounds are closely mown and steep faced bunkers are aplenty. With a strong emphasis on beautiful landscaping based upon a backbone of dense palm plantings, this user-friendly course has a more modern design. Sculpted bunkering punctuates wide fairways leading to greens complexes where perimeter mounding feeds into the putting surfaces with modern conviction. Vivid landscaping with abundance of flowering shrubs and ground covers make a dominant image on this course. Palm trees add a welcome relief from the sun. Take the day to relax around the resort or explore local attractions at your leisure. Find out for yourself why Haikou is described as “the Hawaii of China”!. Based on the Melbourne sandbelt courses with distinctive bunkering surrounding most greens, the course is set up for long drivers with generous fairways. Solid drives will set up shorter approaches that need still to be “on the money” as the large greens are well protected by bunkering and run off areas and feature many swales and humps to challenge your putting skills. 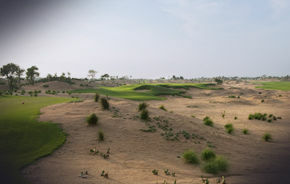 This course offers a unique environment of towering sand dunes and native vegetation found along the vast beaches of Hainan Island. Large undulating contours feed into some of the largest greens at the resort and can leave lengthy putts at times. This course requires skillful navigation and a solid short game with pin-point accuracy to make the most of the soring opportunities. A shortish course at 6600 yards from the tips and par 70, this course features intimate green to tee connections and is an easy walkable course. The crown jewel of the complex, the course weaves through a striking landscape of mature trees, thick jungle vegetation, and expansive lakes and wetlands. The dominating site characteristic is the bed of lava rock, which was capped with material located 25 miles away. A championship course that is quite long (at over 7,800 yards) it is strategically designed with challenging carries over the jungle “munga “and local hazards. Many elevation changes, sidehill lies and hidden greens add to the challenge! ** Afternoon private transfer back to Guangzhou airport for connecting flight.